Installation view at the Jean Hasbrouck House, Historic Huguenot Street. Photo by On Location Studios, Poughkeepsie, NY, 2017. Courtesy Historic Huguenot Street. New Paltz, NY (July 20, 2018)…Historic Huguenot Street (HHS) has extended the special exhibition Living in Style: Selections from the George Way Collection of Dutch Fine and Decorative Art until December 16, 2018. 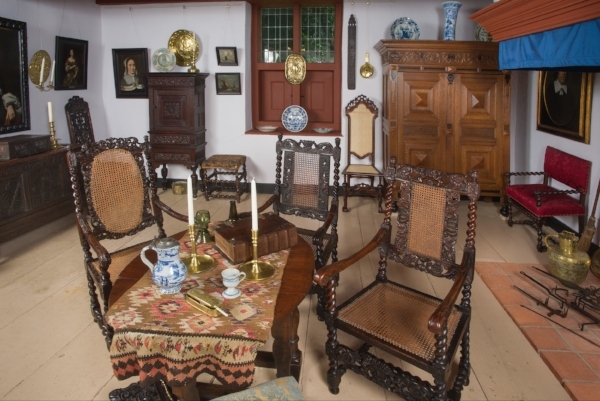 Featuring more than 100 17th- and 18th-century Dutch items from the Netherlands—including 22 oil paintings, a rich diversity of interior furnishings, and decorative and utilitarian objects—the exhibition is installed in a period room in the historic Jean Hasbrouck House (ca. 1721) and celebrates the Dutch culture that flourished in the 1600s and 1700s in New York State’s New Netherland Colony. Oil paintings of portraits, interiors, and genre scenes, Delft ceramics, and other decorative pieces adorn the room. Iron and brass utensils are featured in the jambless fireplace. Pair of chairs after designs by Daniel Marot, ca. 1690-1700. Walnut. Collection of George Way. Photo by On Location Studios, Poughkeepsie, NY, 2017. Courtesy Historic Huguenot Street. The Jean Hasbrouck House, where the exhibition can be seen as part of the general tour, is an exceptional example of traditional 18th-century Dutch architecture in the Hudson Valley. The high-pitched gable roof spanning twice the depth of other stone houses from the period is thought to be unique in the United States. The interior of the house features an original open-hearth, jambless fireplace and reconstructed kruiskozijnen (crossbar windows), both typical of Dutch vernacular architecture, providing the perfect setting for the presentation. Upholstered foot stool, (Gistoffeerde voeten brankje) walnut, barley, or sugar twist frame, 1670-1685, Netherlands. Photo by On Location Studios, Poughkeepsie, NY, 2017. Courtesy Historic Huguenot Street. Funding for the project was provided by a grant from the Peggy N. and Roger G. Gerry Charitable Trust and a private donation. Living in Style is accompanied by a full-color catalogue with text contributed by Ruth Piwonka. Piwonka has worked as a material-culture historian for over 40 years. She is the author of A Portrait of Livingston Manor, 1686‒1850 (1986); and co-author with Roderic H. Blackburn of Remembrance of Patria: Dutch Arts and Culture in Colonial America, 1606‒1776 (1988); and A Visible Heritage, Columbia County, New York: A History of Art and Architecture (1996, 2000). Piwonka has contributed to several other projects including New World Dutch Studies, Dutch Arts and Culture in Colonial America, 1609-1776 (1987) and Dutch New York Between East and West: The World of Margrieta van Varick (2009). 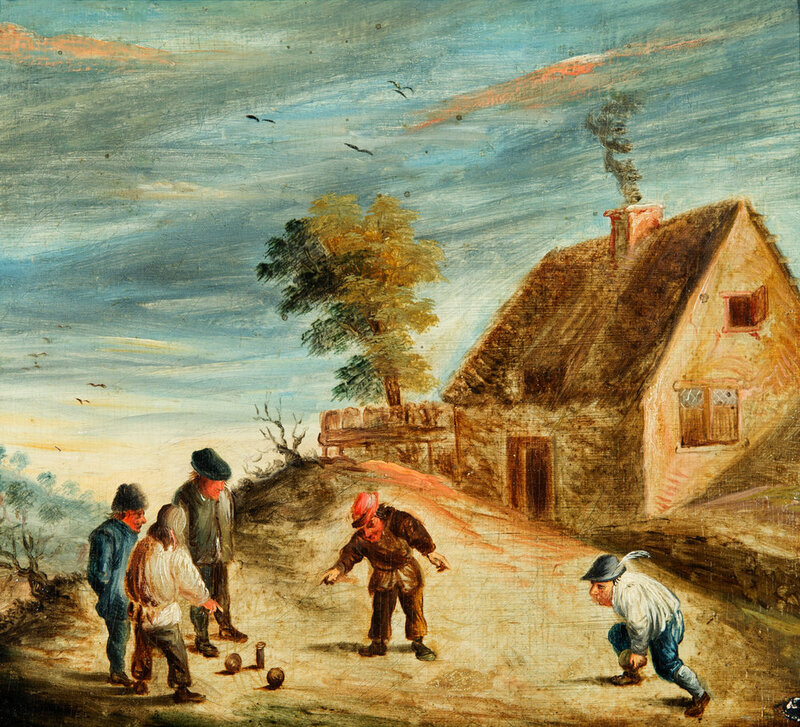 Children Playing Skittles (ca. 1700). Oil on oak panel. Collection of George Way. Photo by On Location Studios, Poughkeepsie, NY, 2017. Courtesy Historic Huguenot Street. For additional information, please contact Frances Vigna, marketing & communications coordinator, at frances@huguenotstreet.org.